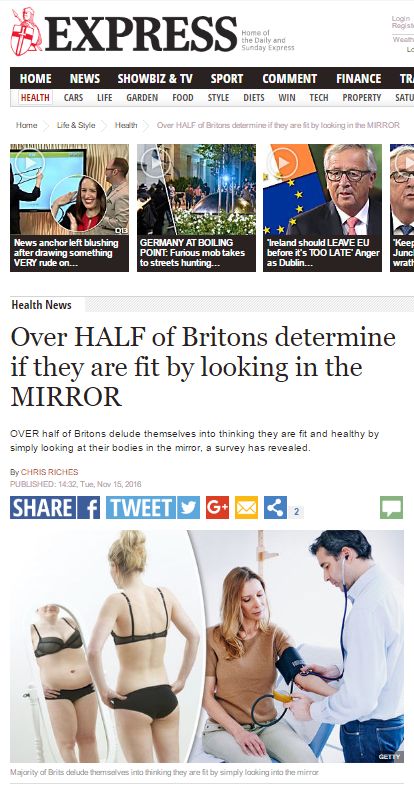 OVER half of Britons delude themselves into thinking they are fit and healthy by simply looking at their bodies in the mirror, a survey has revealed. And 51 per cent of the population would only change their day-to-day lifestyle if they had a serious warning from their GP, the research found. The study exposed UK adults’ misguided approach to health monitoring which appears to be based on us assuming we are fine as long as we look all right. The survey of 1,000 adults, commissioned by Bupa Health Clinics, found people in Bristol agonise for eight weeks before deciding to see a doctor by far the longest in the country. Perhaps it’s time to stop agonising and to commit to seeing someone about that niggling health condition, right Bupa? Philip Luce of Bupa said: “This research shows that despite the fantastic advances we’ve made in medicine Britons still take an age-old approach to their health. “In fact, people are more likely to visit a doctor if they can see something unusual or different about their body than if they’ve been feeling unwell for a few days. And if you’re wondering where you can get one of those health checks done, I’m sure Bupa have some suggestions. This entry was posted in Bupa and tagged bupa, Chris Riches, Express, Philip Luca on November 27, 2016 by Michael Marshall. Many of us claim to feel young at heart when the reality could, in fact, be quite the opposite. Experts have revealed the ‘heart age’ of someone is, on average, more than three years older than their actual age and can vary by years – depending on the job they do. A new study has found people working in manual labour have the worst heart health, while teachers and those working in the medical profession have the best. So should you be worried about your heart and what can you do to improve its health? 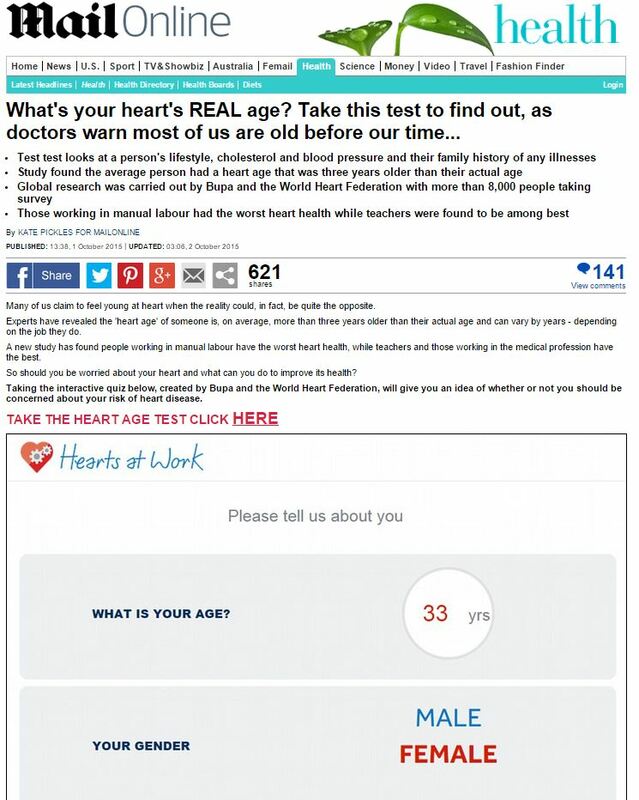 The global research was carried out by Bupa and the World Heart Federation with more than 8,000 consumers completing a heart age check. Dr. Fiona Adshead, chief wellbeing and public health officer at Bupa said: ‘If current trends continue, by 2030 more than 23 million people will die annually from cardiovascular disease. This entry was posted in Bupa and tagged bupa, daily mail, Fiona Adshead, Kate Pickles on October 28, 2015 by Michael Marshall.